The Polar A360 is a fitness tracker that's the Finnish company's first to include its own built-in heart rate monitor technology. Unlike the Polar Loop and Loop 2, the A360 can deliver on the spot bpm (beats per minute) readings and can be used for dedicated heart rate based training. It's also the first tracker from Polar to include a touchscreen display, giving it the look and feel of a Microsoft Band 2, rather than a Fitbit Charge HR. Bizarrely though, unlike the Band 2, there's no GPS onboard or any way to track distance away from counting steps. So it's pretty much the Loop plus on board heart rate tracking. UPDATE: We've put the Polar A360's swimming and gym performance through their paces in more focused tests. Check out our gym tracker big test and swimming tech review for in-depth analysis. It's priced at $199.95 putting it into Microsoft Band 2 price territory and is more expensive than the Charge HR. While we weren't exactly blown away by Polar's Loop trackers, there seems to be more going for the A360. Does it pay the price for leaving out some key features and is the heart rate monitoring up to scratch? We slapped it on for a couple of weeks to find out. Polar might think throwing Swarovski crystals on its trackers is the way to a make its hardware more attractive, but the A360 is more on the money with its looks. It still retains the rugged, durable feel of a sports watch, but the addition of a touchscreen gives it the kind of sleekness that makes me think of the Samsung Gear Fit. Despite its flaws, the Gear Fit did look like something you'd want to wear. The matte band, at 23.5mm wide, is available in brighter colours if you don't fancy something a little more subdued around the wrist. The good news is that you don't need to take a pair of scissors to it, like you have to with the Loop to get the right fit. That's because it comes in small, medium and large band sizes, so it should accommodate most wrist sizes. Keeping things in place is a two-pronged clasp that has unfortunately come loose when I've worn it in bed on several occasions. The band can have a habit of picking up fluff as well, but it's nowhere near as bad as it is on the Moto 360 Sport or Sony SmartWatch 3, which use very similar looking bands. Sitting inside the band is the tracking module, which also holds the colour touchscreen display flanked by silver ascents. It's a not so impressive 80 x 160 screen resolution but fortunately, with such a simplistic UI to deal with, that's more than suitable. It's bright, vibrant and, while you can't adjust screen brightness, visibility in bright sunlight or at night is no problem here. Screen responsiveness is on the money as well, registering even the sweatiest swipes with ease. Polar's decision to offer a selection of watch faces that can display details in both horizontal and vertical screen orientation is a nice touch too. There's just a single physical button on the left side, but its uses are limited. One press will simply turn the screen on or off and holding it down will let you pair it with Polar's H7 heart rate sensor chest strap (more on that later). The module is removable as well, making it a little easier to charge and give the band a wipe down when it's not in use. I'd recommend making sure the module is clipped back into place properly as it can have the habit of leaving a gap between the tracker and the band when it's around your wrist. If you like taking a dip, the A360 is waterproof up to 30 metres, so you can take it swimming. There's not many trackers that can offer that although heart rate monitoring isn't fully optimised for tracking in the water. On the bottom of the A360's module is where you'll find the optical heart rate sensor. 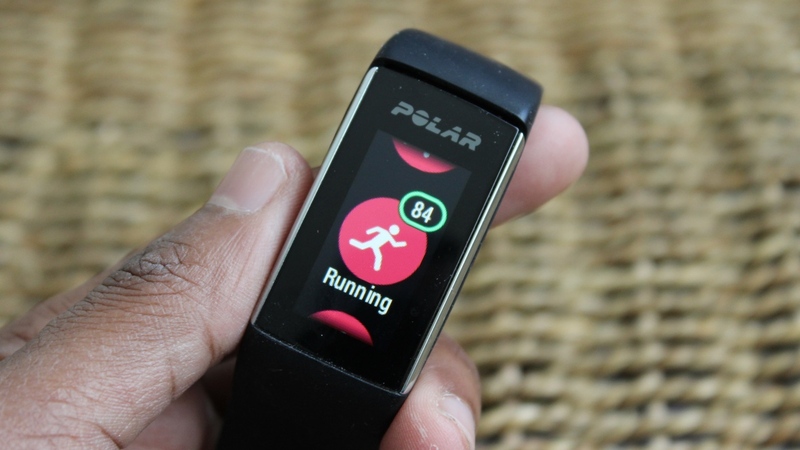 It's Polar's own proprietary technology, but it works in a very similar way to a Fitbit or Mio's sensors, flashing lights to detect changes in blood volume to generate a reading. The icing on the cake though is the exposed Micro USB charging port, which means there's no silly charging cradle to carry around and that is a big plus. Aside from heart rate monitoring, the A360 offers some pretty standard activity tracking features. The big difference is the way the data is presented and analysed. It'll record steps, distance (steps only), active time, burnt calories and automatic sleep tracking. On the device, that information is presented under the My Day section. This pulls together activity tracking and logged training sessions for the day letting you quickly glance at step counts, distance and calorie counts. Inside the Polar Flow companion app, it'll actually breakdown tracking into Resting, Sitting, Low, Medium and High intensity levels. It's actually quite a nice way to get an idea of how long you've been active or sitting at your desk at work. Annoyingly, tracking data on the A360 is only stored for the day, so you'll need to go back to the app to view progress over a longer period of time. One of the nicest features though is that by tapping on the My Day data you can see what activity you'll need to perform to make your daily goal. That could be rope skipping for 20 minutes or finding time to fit in an hour-long jog. To keep you motivated, there's a pretty useful inactivity alert that sends a purposeful vibration to the band after 55 minutes of inactivity and will collect the inactivity alerts inside the app like a collection of naughty stamps in a homework book. As far as tracking accuracy is concerned, the A360 handles things pretty well. The problem with pretty much every other fitness tracker is that no two devices are going to deliver identical results, simply because the monitoring is based on unique algorithms despite using identical motion sensors. The best you can ask is that it's not too far out with its readings. Up against the Jawbone UP2, step count was generally within 1-200 steps within Jawbone's data. It was a similar story with the automatic sleep tracking although there's not a lot happening on the analysis side on both fronts. The comments on how active your day was and how long you've been sitting for are nice touches but are quite easy to ignore. There are some elements here that Polar does really well, but there's definitely room for improvement, especially from a motivational perspective. Ultimately, monitoring heart rate from the wrist is the A360's big party piece. This is Polar's first wrist-worn device to have its own proprietary built optical heart rate sensor to help more accurately measure training intensity without having to wear a chest strap-style monitor. It doesn't continuously monitor heart rate 24/7, but you can get on the spot readings. It's in training mode where Polar hopes you'll make the best use of it. This means you can work within specific heart rate zones or see more accurate readings based on the type of workout. Those different type of workouts or Sport Profiles can only be set up through the Polar Flow web app, where it's a case of picking a sport and it'll be synced to the device. Interestingly, the A360 can also be paired with Polar's H7 heart rate monitor chest strap to activate Polar's Fitness Test. According to Polar, the H7 is more responsive to rapidly increasing or decreasing heart rate, which is the kind of thing you'd associate with interval training. That to me suggests Polar doesn't have much faith in the A360 and its ability to accurately cater for serious trainers here. To test the resting heart rate monitoring accuracy, I put it up against Polar's own H7 paired with the Polar Beat app and readings as you can see from the image were way off. Once you get out running with it, things get worse. I took the A360 out for several runs while also wearing the TomTom Spark and the Polar H7 heart rate monitor chest strap paired with the Polar Beat Android app. The screenshots below show how wide of the mark the readings were for one of the sessions. With the A360 falling well below the Spark and the H7, the heart rate zones recorded also appeared massively inaccurate. This wasn't a one off either. Unfortunately, this is is one of the worst optical heart rate sensors I've tested. You can, of course, use the heart rate training for other activities so I gave it a spin in the swimming pool as well. Optical heart rate sensors are not built for the water but you do get some useful data here and the app is able to determine whether the session benefited your aerobic fitness levels. Ultimately though, if you care about accuracy, the A360 isn't quite there yet. If you want to dig a little deeper into data, you need to spend some time in the Polar Flow mobile app, which is available for Android and iOS. As already mentioned, you'll need to dip into the Polar Flow web app as well to set up the training modes on the tracker and it'll give you a nicer view of the data graphs as well. Unfortunately, there doesn't seem to be a way to use the A360 with the great Polar Beat app, but there is a decent amount of third party app support letting you connect to MyFitnessPal (iOS only), MayMyFitness, Apple Health and Google Fit. If you really want to explore training sessions, you can export data as TCX, GPX or CSV files, so it's covering a lot of bases here. In terms of using the app, user interface displays data that's easy to digest, burying the extras when you scroll down. It's perhaps not as clean or as slick looking as Jawbone or Fitbit's apps, but it certainly doesn't overload you with information. There's a dedicated button for breaking down data by day, week or month with a drop down menu letting you see an activity feed and a training diary with all your logged sessions. As far as customisation goes, you'll also need to venture here to turn do things like setting up an alarm. adjusting measurements and choosing your level of daily activity goal. As companion apps go, it's a good experience all round but it doesn't bring anything radically new to the table. Like the Loop and Loop 2, the A360 supports display notifications from your iPhone or compatible Android phone. There's a list of compatible devices on over on the Polar website. This time though, there's a nice screen to view messages, emails, and notifications from third party apps. When a notification appears only the first line of the message appears along side a cross icon to close it. There's no way to scan through the entire message. So if you want to read it, you need to go back to your phone. The more annoying aspect of notification support is the delay in receiving the notification. There's a significant delay in some instances especially for instant messaging services. Worst of all, some messages or calendar appointments you've already dismissed can appear repeatedly on occasions. Where the A360 impresses, at least on paper, is battery performance. There's a 100mAh battery packed into the tracker's body that can deliver two weeks of power. That is based on using it only as an activity tracker and without notifications turned on. If you're going to take advantage of the notification support and heart rate-based training as well, it's closer to five days, which is pretty much what I found. From an activity tracking perspective, that's a good showing, but I imagine that people looking at this will want to take advantage of the heart rate monitor, so the 5-6 day battery life based on one hour of training a day is more realistic and reflective of the performance. The Polar A360 could have been a brilliant addition to the current glut of activity trackers, but it's let down by some pretty major issues. The heart rate data accuracy issues along with the omission of distance tracking stand out as the biggest flaws. It's a shame really, because Polar has the basis of a good device here and is far more appealing than the Loop or Loop 2. If you've got the money to spend and you're a fan of Polar, the M400 feels like a better all-round option. You still get the activity tracking along with GPS and while you don't get a built-in heart rate monitor, it has a lot more going for it if you're willing to spend a little extra.